Infinitas is a new project of Agape, brought forth by the hand of Isabel Fernández. Isabel dreamed about making a magazine for women that was out of the ordinary...not just to help her feel more physically beautiful, more confident, nor to give advice on how to live better. Infinitas wants to present women just as they are, with their weaknesses and their virtues, with their struggles, problems, joys, challenges, dreams, fears, etc. 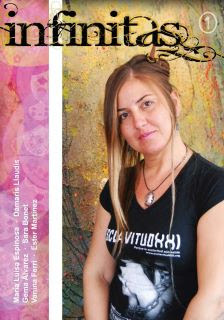 Nestled in this month´s edition is the story of an artist who, through her creations, denounces an atrocity that she is fighting against, that is imprisoned women of the mafias and sexual exploitation. Also there are testimonies about abortion, cancer, mothers of families with multiple children, the challenge of caring for a child with disabilities. Finally, Infinitas inteviews Esther Martínez, a well-known Christian psychologist. You can get a copy of the magazine at the Infinitas web site or at www.agape.org by clicking the "Resources" tab. Don´t miss this opportunity to hear the stories found in this magazine. And recommend it too! Show it and share it with your friends and contacts. You´ll be surprised by the response.